New York Artists Equity Association, Inc. (“Artists Equity”) is a 501(c)(3) non-profit organization founded in 1947 by artists, arts patrons and arts professionals. 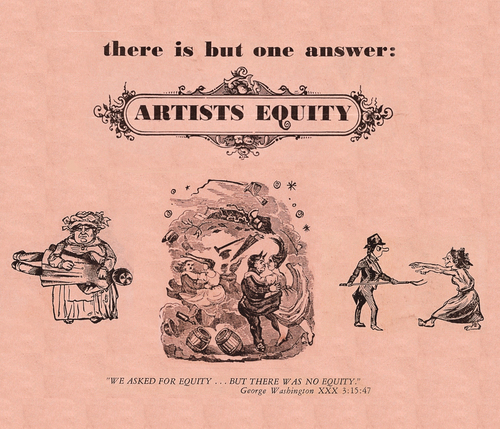 Artists Equity was created by more than 160 leading American artists of the 1940s, including Will Barnet, Thomas Hart Benton, George Biddle, Paul Cadmus, Stuart Davis, Arthur Dove, Marsden Hartley, Edward Hopper, Leon Kroll, Jacob Lawrence, John Marin, Louise Nevelson, John Sloan and the first President Yasuo Kuniyoshi. These diverse artists were all clear on one point -- they had to band together to establish and protect artists' economic well-being. Artists Equity was quick to act on the need to include not only artists but all the business people who artists interact with in the course of their careers, including art dealers, galleries, museum curators and administrators, publishers and collectors. We continue to invite everyone to be a part of Artists Equity! See below how YOU can be a part of Artists Equity and help us continue our mission to support artists.